Power Keno - Play Online - Casino Answers! Power Keno is a thrilling version of Keno played almost the same way as a regular Keno but using multiple cards. However, the mention of multiple cards should not scare you since it’s just like the regular Keno where one plays with up to seven cards. Here, you choose up to 15 numbers on the grid of 80 numbers that are available. After selecting the numbers, then press play, the game board slows then reveals the winning numbers. Power Keno is available to play online at WinADay Casino. Remember, the more numbers you choose, the higher the chances of winning bigger sums of money. If the 15 numbers selected matches the winning numbers, you stand a chance of winning larger amounts of money. In fact, you can win up to 10,000 times your stake. Power Keno has a bonus where if the 20th number chosen matches one of the winning numbers, your winnings are quadrupled. As a result, you can win up to 40,000 times the initial stake. • Quick Pick – Upon selecting this option, the computer randomly generates the numbers to bet on for you. On the left of this button are a plus and minus buttons. These helps you to determine the numbers to be randomly picked; between 1-15 numbers. • Clear – to select new numbers; the clear option helps to reset the previously selected tickets. • Tickets Overview – this button is located on the left of the game board. Its main function is to activate and deactivate cards. • Auto Play Mode – this commands the computer to play rounds for you. You can choose; 5, 10, 25, 50, or 100 rounds at once. • View Payoff Chart – this is a quick way to see what you will win depending on the numbers chosen and how many you catch. i. You MUST play more than two cards since it is a multi-card Keno. ii. You MUST place equal stakes on all the cards you play since they all have equal chances of winning. After choosing your numbers, you click on the “BET” option which scrolls through the amounts and only stops after you specify your betting amount. Now click the “PLAY” button at the bottom of the screen. 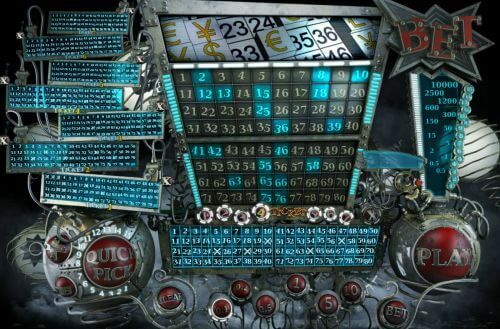 After some time, the winning numbers are displayed on the screen. Your winnings depend on the numbers matched per ticket. Power Keno is available on land based casino centers and regular video keno machines. However, the most convenient Power Keno is the online keno casinos. Online, Power Keno is offered by WinADay Casino where you can choose to play free or with real money and stand a chance of winning 10,000 times your stake. Here, you just play online in a web browser. To play at WinADay, you must be registered. Later click on the games option located on the left of the WinADay logo. Open the “Others” option to open a screen with 4 games; among them, Power Keno is listed first. You can choose to play it and enjoy. The game sounds amazing, looks nice and is quick and easy to play with up to 7 times winning chances. The large number of cards involved increases the excitement while improving the chances of winning. You should try this game to witness all these amazing features. Is Power Keno the best multi card keno game? Power Keno is the ONLY Multi Card Keno game online – so yes it’s the best multi card keno game!